Though most people don't consider winter to be prime biking season, cold and snowy days are conducive to many other outdoor pursuits, and I believe biking can and should be one of them. Even for us in the bicycle industry it's hard to make a daily commitment to biking through the cold and snow. If you enjoy other outdoor activities in winter, like walking, running or skiing, try adding biking to the mix. Provided you are well-prepared, winter biking builds character and stamina, and can be a lot of fun. Here are 10 great reasons to get on your bike this winter, if not daily, then at least once in a while. I came across these reasons, neatly compiled, just about ten years ago on a blog called RocBike from Rochester, NY, which -- sadly -- no longer exists, at least not in the same form. Unless your car is perpetually stored in a garage, one of the worst parts of winter driving is frequent window brushing and scraping. Some motorists cut corners on this important step and dangerously operate at reduced visibility. A bike’s complete lack of windows makes visibility a non-issue. Unless you’re expecting company, there’s little need to shovel, blow, or plow the driveway if your bike is your mode of transportation. Spend that time you saved in the morning reading the paper, or in the evening cozied up by the fire. 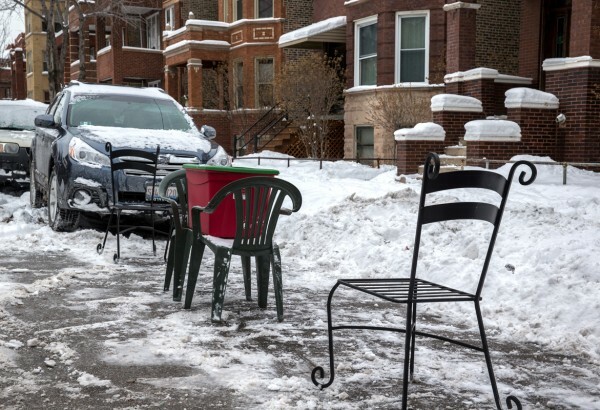 Digging your car out of its on-street parking or making it over that hard packed snow at the end of your driveway can build character, but why bother when you can ride a vehicle that you can walk or carry if the going gets tough? Cars can get you out to remote mountains so you can pay to strap fiberglass to your feet and fall down them. But what if you could avoid the price of lift tickets and season passes and still get your fill of quickly moving past snow-covered stuff? While you make your way to work? Bikes can help you with that. Have you ever filled your tank with less gas than you usually would, just to get out of the cold? Bikes don’t have gas tanks, and the time you spend outside is time when you’re active and generating more than enough heat to stay comfortable. You are a beautiful person no matter how much you weigh, but excess weight can lead to chronic health problems and lower activity in the winter can also contribute to “seasonal affective disorder.” Ride a bike to help avoid these winter problems. Studded car tires on cars are popular in Scandinavia, but in the U.S. they’re often frowned upon due to the road damage they cause. Studded bike tires are unregulated and easy to come by in regions with snow and ice. I’m pretty sure a bike with studded tires is one of the best things imaginable for handling icy roads. Drive or ride around after a big snowstorm and you’ll see cars in ditches, left abandoned after their operators lose control. You can’t just bail when your 2 ton cage hits some ice and starts recklessly sliding about. While it’s not always fun to bail from a bike, it’s certainly much easier, and both bike and operator usually come out fine in the end. Winter is beautiful. Why experience it through fogged up windows with the radio blaring when you can be out in the middle of it all? There is a lot to enjoy: the invigorating cold air entering your lungs, the sights of your town blanketed in white, the satisfying sound of your bike crunching snow. Winter is often ignored because people are too cold and depressed to pay attention. Biking gets you out there and keeps your blood flowing.